Garry O'Connor is moving to a new role at Yarrow Park, with a new first-team coach set to be named very soon. Selkirk FC expects to announce the appointment of a new first-team coach tomorrow (Tuesday) night, as Garry O’Connor moves to an alternative role at Yarrow Park. The 33-year-old ex-Hibernian, Birmingham City and Scotland striker is set to be the club’s new director of football and will also be playing a part on the commercial side. 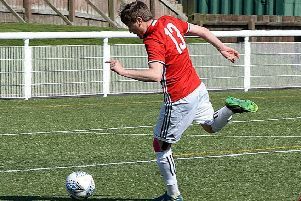 Club chairman Ross Anderson said it was a pre-arranged move and was designed to expand O’Connor’s remit beyond the first team. The three-year contract extension signed recently by O’Connor was as a player, rather than a manager, and also represented a review of of a number of issues at the club, said the chairman. Over 30 applications had been received for the manager’s post, which had not even been advertised, said Mr Anderson, while the club had a good idea who it wanted for the job. “We have a specific guy whom we have been looking at for the last two or three weeks,” he confirmed. Mr Anderson conceded results had been poor too – Selkirk have slumped to seven straight Lowland League defeats – but they were not the main reason for the reshuffle. The club believed in the style of play which O’Connor had nurtured and had been prepared to “take a step back” while the squad was being constructed. O’Connor “has a lot to offer, with his contacts and building bridges with other clubs”, but his duties in training with the first team had placed restrictions on those activities, said Mr Anderson. The former Lokomotiv Moscow player would also aim to attract new sponsors to Selkirk and he had been successful in that regard already, as some names had come in because of his association with them. A shift to other duties would also help with his family and other commitments. “We are not looking for people to leave the club – we are looking to bring more people in,” stressed Mr Anderson. “We have plans to expand the under-20 side and we want to put in a 3G pitch, with floodlights ,at Yarrow Park in April. Mr Anderson said the club had indicated to O’Connor’s assistant, Joe Brown, that they wished him to stay on, although they would be speaking to everyone who was interested in the coach’s role. “We are trying to be fair to everybody but looking at the safeguards for the club, and what is best for the club,” he added. Selkirk haven’t won a game since their 4-0 triumph over BSC Glasgow on October 1 and the latest defeat – a 6-0 thumping on Saturday by Spartans – deposited them back at the foot of the Lowland League table. But Mr Anderson said they remained hopeful they could pull clear once again. Selkirk had a very young squad – only around three players were above 20 – and while a number were very talented, there were not too many more experienced players to help them develop, and not a great deal of strength in depth to cover injuries, suspensions or other absences. “When they win, they win well. When they get two or three defeats, especially when they didn’t deserve to be beaten, the heads go down very quickly with youngsters, and it is quite hard to turn it around without some experienced boys in among them, helping them through,” said Mr Anderson. “We are still confident we will push up. With youngsters, you have to let them learn and develop, but sometimes you have to take a step back there and a kick to go forward.